Thoughts on faith, hope and love. Welcome to 2015. On the first day of the year, the Church celebrates Mary as Mother of God. She wasn't just a vessel, someone God imposed upon to make the Incarnation occur. She agreed to it. God most certainly loves her in a special way - she's Jesus' mom! Today at mass our priest told stories of how people endured difficult situations by praying the Rosary. The Rosary is not a prayer to Mary - it's praying with Mary. She loves us as her children and only wants the best for us. Her role has always been to facilitate and cooperate with God's plan - she wants to help us get to Heaven where God has always wanted us to be. I really like the thought of storming Heaven with prayer by enlisting others. Enlisting the Mother of God in prayer is about as good as it gets. I can ask her to intercede on my behalf, but I also ask her to lead me closer to Jesus. She must know the way. On my lifestyle blog, Straddling the Gap, I said yesterday that I don't like making New Year's resolutions. However, after hearing our priest talk today I want to accept his challenge to incorporate the Rosary into my regular routine in 2015. 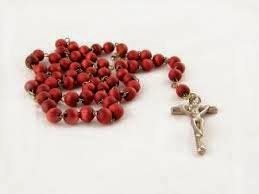 Don't know how to pray the Rosary? Here are some instructions you can print out and use yourself.